What Does Your Training Plan Include? Weekly Guidance Notes on how to restructure your training week should you need to, as well as clear session priorities if you are particularly short on time. This training plan has been designed following the principles of the T.I.M.E. Training System. Developed by Coach Rob Wilby & Team Oxygenaddict, this 70.3 & Iron-distance training methodology is being used by age-group athletes all over the world with incredible success. It has been developed specifically to enable busy age-groupers to consistently deliver outstanding performances even if they have hectic work and family lives that result in limited, unpredictable training time. E: Effective Effort Every single minute of prescribed training in this plan is designed to provide the biggest possible progress towards your goal. Training time comes at a premium, so you can't afford to be training ineffectively. British Triathlon "Coach Educator & Assessor" - developing the next generation of triathlon coaches in the UK. Host of the popular "Oxygenaddict Triathlon Podcast"
6 x 100 easy, on 15s rest. Push long and smooth off the wall. 2 x 100 easy, on 15s rest. Warm up: (10 mins) 5 mins easy spin, gradually increase effort 3 mins as 30s fast effort, 30s easy recovery 2 mins very easy spin - - - Main set: (30 mins) 2x (1,2,3,2,1) min HARD effort (top Z4 FTP effort) off 1 minute easy spin (little ring) recovery. Efforts in aero position if possible. - - 4 mins easy spin recovery between sets - - - - Easy spin cool down for the rest of the session. Note: If it's been 8 weeks or more since you last did a CSS test, or you feel as though your fitness has significantly changed since the last test, do this test today INSTEAD of the other scheduled swim session. Make sure you record your times for the 400 and 200 time trial. Swim them as fast as you can, but don't start off too fast and then fade. Remember, even pace will not feel like even effort - you'll have to build your effort through each TT. Warm Up: 5 minutes gradually building to E pace. Main Set: Run the rest of the session holding E-pace. Breathing should be relaxed and regular. Think about technique as you run - relaxed shoulders, hand position in front of bottom of rib cage, elbows bent at ninety degrees. Imagine being pulled forwards by an invisible string from the center of your chest. 1,2,3,4,5 min HARD effort (HR Z4, 100% FTP), each off 1 minute easy spin (little ring) recovery. Efforts in aero position. INTRODUCTION: You will need your HR monitor on for this test. Use a flat course, either on a track, or 3 x 1 mile loops. This will feel STEADY, not HARD. Warm up - Loosen up, then 10 mins easy running, gradually increase HR, but stay below target test HR. TEST: 3 miles holding Target Aerobic HR. If your HR starts to rise above Target Aerobic HR, then you will need to slow down. This is quite normal. Record your mile splits. 5 - 10 mins jog/walk, stretch as appropriate. This test, done regularly, will show you how your run pace improves at the same heart rate. 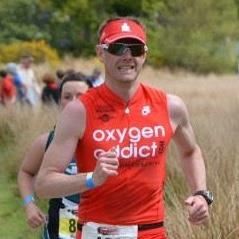 I am a professional triathlon coach - www.oxygenaddict.com is my full time job. I specialise in coaching Age Group athletes who are serious about improving their performance - aspiring Kona and 70.3 WC qualifiers, and age group GB representatives. I have coached over a hundred triathletes to successfully reach their goals - from professionals to those completing their first triathlon, through multiple Team GB AG qualifications, to multiple Kona and 70.3 WC qualifiers, to one World Champion.